Upasha Niku Talukdar is a worthy Ekalavya to a digital Dronacharya. 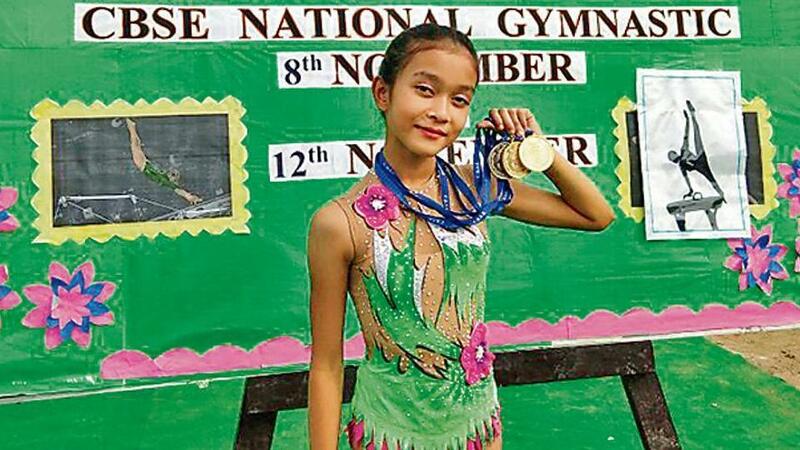 The 10-year-old from Guwahati in Assam is arguably India’s youngest and most decorated rhythmic gymnast. She recently won two gold medals and a silver at a national school event. But unlike the famed Mahabharata archer, Upasha wasn’t turned down by a guru. She just couldn’t find one. No one in the Northeast would coach her in rhythmic gymnastics so she turned to YouTube. Soon, Upasha, who took to the sport that combines dance, ballet and gymnastics when she was 8, had Olympians “coaching” her. She watched videos of Ukrainians Anna Bessonova, Ekaterina Serebrianskaya and Tamara Yerofieieva and Russians Irina Tchachina, Yevgeniya Kanayeva and Alina Kabaeva. The six, who have 212 medals between them, were among several of Upasha’s virtual teachers. “She has always been flexible, twisting and turning and dancing to music. They day I saw her scratching her ear with her toes because her hands were occupied with homework, I decided she was cut out for gymnastics,” Hindustan Times quoted Nikunja Talukdar as saying. In 2015, he took Upasha to gymnastics coach Ghanajyoti Das at Guwahati’s National Institute of Sports. After a test, Das suggested rhythmic gymnastics but expressed his inability to coach, saying he was an artistic gymnastics trainer and would be of little help to Upasha. “I knew nothing about gymnastics except that the Russians are very good in it. The two of us then Googled and found many videos on rhythmic gymnastics on YouTube,” Nikunja said. Upasha began copying their moves, postures, the rolls and the stretches, the leaps, everything. She watched closely as the gymnasts worked with balls, clubs and hoops. She also began improvising. Basics done, Nikunja took her to Punjab for a 10-day course. But it were the lessons from the European legends via YouTube that served her well. At the CBSE National Gymnastics held in Radaur, Haryana from November 8-12, Upasha won the best gymnast while the other gold came in the ball routine. The silver was for her clubs routine. “I want to represent India in the Olympics and win a medal in rhythmic gymnastics,” Upasha said. But Nikunja knows YouTube can take her only that far. “I have networked to get through to a Russian trainer named Marina. We communicate with her via Skype,” he said. Marina was so impressed by Upasha that she offered to train her but for that, she would have to go to Russia, Nikunja said. “For a middle-class family, it’s easier said than done. I hope I can organise the resources for my only child,” said Nikunja who earns around Rs 50,000 a month.